The Ghost Nebula is a reflection nebula that has several stars embedded within the nebula. These stars give the nebula an eery brown color. The nebula itself consists of numerous Bok globules - areas where the dust and gas is condensing to form protostars. The dark nebula to the right of vdb 141 is LDN 1435. Within this nebula is a Herbig Haro object known as HH 157 which is probably a binary star system in formation. Also known as Sh2-136, the Ghost Nebula is about 2 light years across and 1200 light years away. 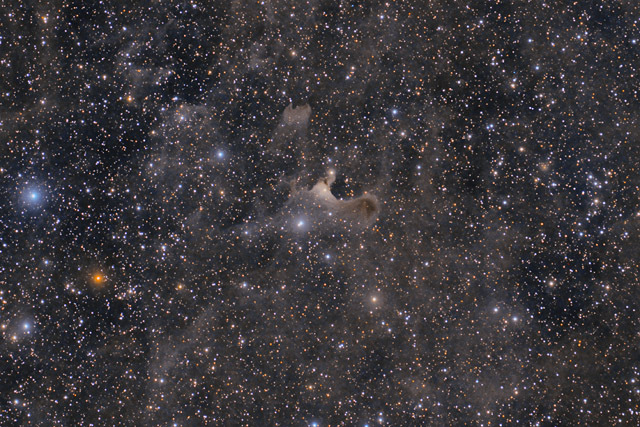 The surrounding nebulosity is uncatalogued, although these dust clouds are pervasive throughout the constellation of Cepheus. My wider version of this image shows more of this extended nebulosity. In this image, North is down. This image is cropped to 51% of the original full frame. Software Used Images Plus 5.75 for camera control. Images Plus 6.0 for calibration, stacking, digital development, arcsinh stretching, star shrinking and halo reduction, smoothing and noise reduction, and Feature Mask. Photoshop CS5 used for levels and curves, screen mask invert, high pass filter, lab color, selective color, match color, saturation adjustments, lens correction, and cropping. Pixinsight 1.8 for framing, histogram transformation and star masking. HLVG for additional color correction, Gradient Xterminator for gradient removal. Carboni Tools for additional noise reduction and smoothing. Focus Magic for focus restoration. Registar for stack alignment. Notes I began capturing data for this image back in September, but at the time I had not fully corrected some of the collimation issues with my new (to me) Nikon 600mm lens. As a result, the quality of the data wasn't that good, and I ended up not using over 20 hours of data that I captured that month! Quite frustrating, but the 9+ hours that I captured in November was enough to make a decent image. To further frustrate my efforts, the three nights I photographed this object in November had some episodes of high clouds and generally poor transparency. In some respects, I'm surprised I captured anything! Despite my trials and tribulations, I'm happy with the final result. The noise level is a bit higher than I prefer, a consequence of very aggressive stretching in conjunction with less data than I had originally intended. I still managed to capture some nice details, and I really like all the subtle nebulosity throughout the field of view.